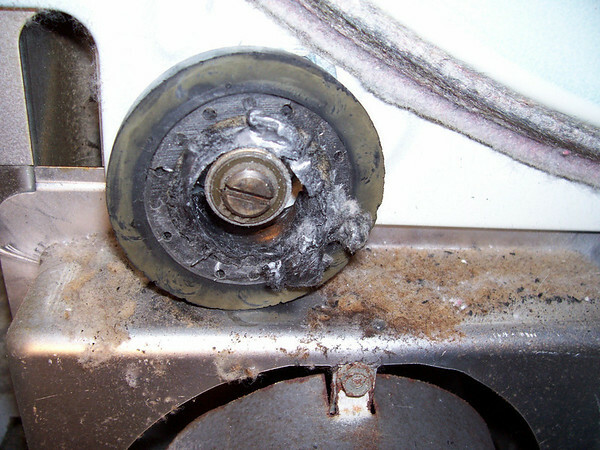 If your dryer rumbles and bumbles when you run it, then you probably need to replace the drum rollers. This page will help you take the dryer apart so you can check ’em out. …then you need new rollers. Come git you some. Actually, that’s one of the worst cases of roller wear I’ve seen. The rollers are also bad if they’re stiff or if they make a chattering sound when you spin ’em with your fingers. These rollers are sold individually. As long as you’re going to the trouble to replace one, go ahead and replace the other one for just a few bucks more because it’s not long for this world. So buy two. You’ll also need these snap ring pliers to remove the snap ring that holds the drum roller on the shaft. And you’ll like this service manual for Amana dryers. This entry was posted in Dryer Repair on January 22, 2007 by Samurai Appliance Repair Man.